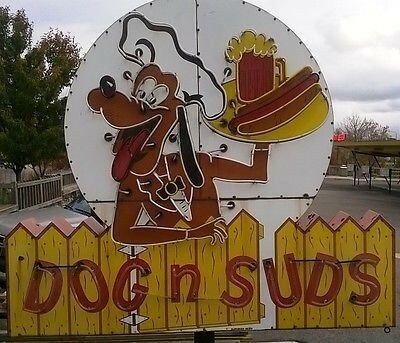 This goofy looking Dog-n-Suds sign is perfect. The size, the design, and the character all makes this a good collector’s item. This sign shows an illustration of a dog holding a platter of hot dogs and a frothy drink. The dog is wearing a chef’s hat with a large smile on his face. Below the dog is a yellow picket fence with the words “Dog n Suds” written across it in a very cartoonish way. The sign is a neon and is a double sided porcelain sign.